Ubisoft was by far the most impressive booth at E3 this year. Not only were all of their games genuinely fun, but they also seem to understand new technology better than the people who created it. 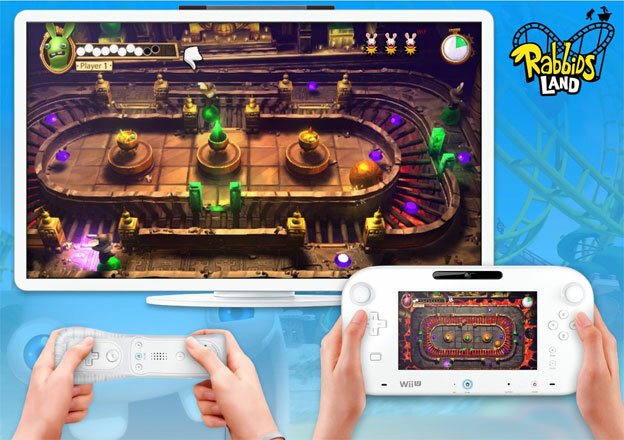 Just look at how Ubisoft handled the Wii U. They had ZombiU, an extremely innovative survival horror game; Rayman Origins, an incredible platformer that made use of the Wii U's touchscreen far better than New Super Mario Bros. U did; and Rabbids Land, their foray into the casual gaming space that served as both a party game and Wii U tech demo. 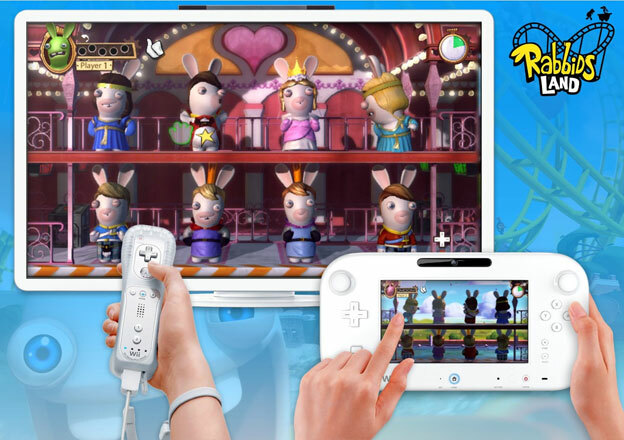 Set up as an almost direct competitor to Nintendo's own tech demo, NintendoLand, Rabbids Land shows off what the Wii U can do like few other games can. Ubi's iconic Rabbids are known for being in minigame compilations, and Rabbids Land is no exception to that rule. However, this time the minigames are all tied together with one big Mario Party-style board game. The specific rules of the board game have not yet been revealed, but most likely we will be seeing concepts such as minigame spaces, shops, spaces that let you advance through the board quicker, and more. 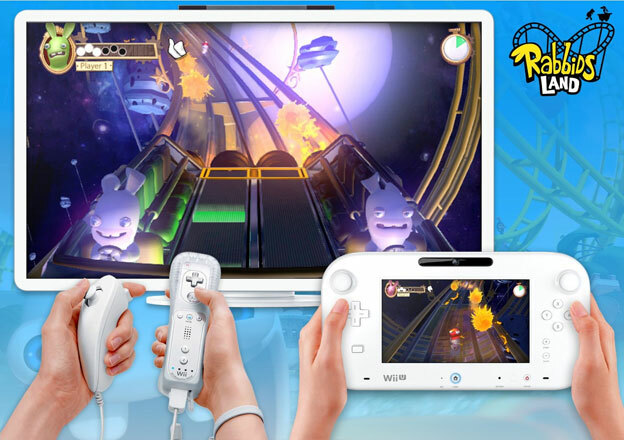 The game is controlled with the Wii U GamePad and up to three Wiimotes. Remember when Nintendo said that the future was asymmetrical gameplay? Well, Rabbids land has asymmetrical gameplay coming out of its ears. Every minigame is some form of "three versus one" game where the GamePad player has an entirely different goal than the Wiimote players. Now, that doesn't mean that the GamePad player will hold the GamePad the entire game. An Ubi booth rep said that players will sometimes need to switch controllers around for different minigames, in order to be sure that the right player has access to the GamePad. In addition, Wiimote players will sometimes have to attach Nunchucks in order to play certain minigames. Unfortunately this means the full game package requires three Wiimotes, all with Wii Motion +, three Nunchucks, and one gamepad. It's a hefty investment if you haven't already picked up these items. However, games like these tend to live and die by the quality of their minigames, and Rabbids Land certainly seems to be doing alright in this respect. Each one takes the asymmetrical gameplay concept and really drives it home. In fact, some minigames involve two styles of gameplay that aren't even in the same genre. 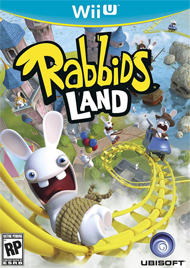 For example, one minigame features Rabbids on a rollercoaster with another Rabbid following behind them. The Rabbids on the coaster actually play a rhythm minigame. They shake the Wiimote or Nunchuck to the beat in the style of Rock Band or Dance Dance Revolution. Doing this causes the rollercoaster to generate fireballs, which shoot backward at the Wii U GamePad player. Longer note streaks cause more fireballs to be generated, eventually filling the screen with dangerous projectiles.